My daughter, Sage, is fond of saying that she has a green name, green eyes, and a green birthstone. It's also her favorite color, so I was elated at the chance to partner up with KidsGold -14k for Kids to review a pair of emerald earrings. These are well made, gorgeous, real gems and gold, and they're a huge hit with my daughter. She wore them to her 8th grade homecoming dance, with a designer dress in... you guessed it, sage green. Disclosure: We have been compensated with a sample pair for review purposes, as part of US Family Bloggers. All opinions are my own. These earrings are comfortable, with a light weight and rounded post, so even babies or young children can wear them. They're an excellent grandparent gift, birthday keepsake, or memento to mark a special occasion. And kids won't quickly outgrow them like clothes! My teen adores hers and plans to treasure them into adulthood. Highly recommended! Got a daughter with pierced ears? We have a great special to share, for 14k Gold .50ct TW Genuine Birthstone Earrings. We have been compensated with a sample pair for review purposes. Since ancient times the wearing of birthstones has been thought to bring good luck and good health. Every month has its own special stone, each with own fabled qualities and benefits. I'm so happy we ordered an emerald pair for my May daughter, born on actual Mother's Day. 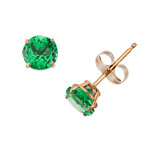 Now KidsGold -14k for Kids is offering your favorite girl her very own pair of 14k Gold .50ct TW Genuine Birthstone Earrings in a beautiful basket setting at 20% off! All months with their corresponding gemstones are included! Each pair of 14k Gold Genuine Birthstone Earrings comes Gift Boxed with a Matching Tote + Free Shipping!